Module 1:$450 if paid in full by 4/30/2019, $500 after that date. Module 1 is Open to the Public. Module 2: $450 if paid in full by 8/6/19, $500 after that date – Module 2 is open to only those in the Certification Program. You can receive a full refund (minus $50 administrative fee) up to two weeks before the training. If you cancel less than two weeks before the training, your fee will be transferred to the next available training taught by Jacy. Module 1 is open to the public and it can be taken as a personal healing exploration. 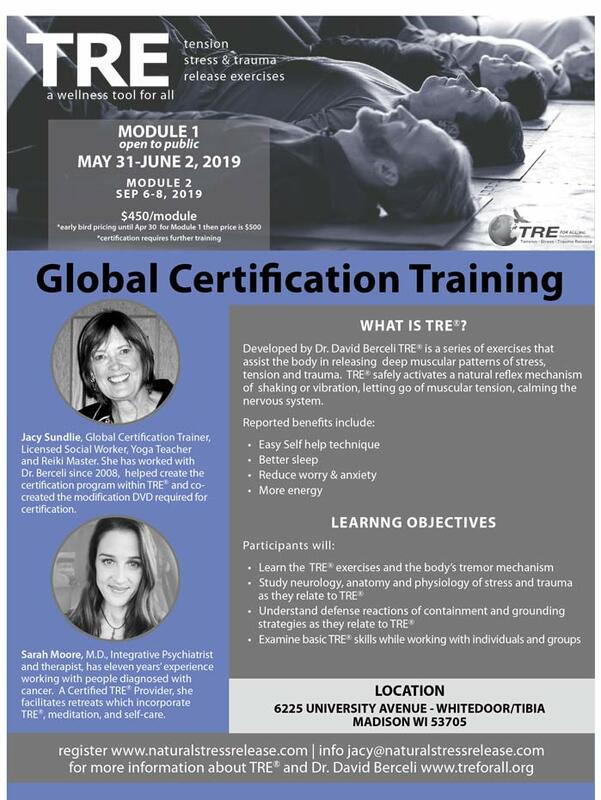 Module 2 is only open to people who are enrolled in the TRE certification program to become TRE providers. Facilitators: Jacy Sundlie and Sarah Moore, M.D. Jacy has been involved with TRE since 2008. She has been a Certification Trainer since 2010 and helped develop the first TRE certification program. As a licensed Social Worker, RYT Yoga instructor, massage therapist, Life Coach and Reiki Master, Jacy brings all of these modalities into play to enhance the TRE trainings. 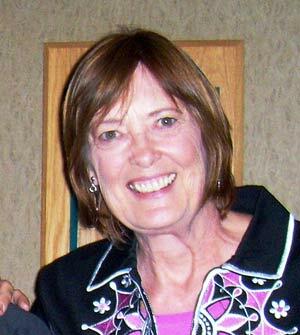 She has been leading the way teaching groups of students in the TRE certification process. Jacy also developed the first program within the VA system in Madison, WI certifying staff to teach TRE to veterans which continues as an integral part of their therapy. Jacy uses her creativity and sense of humor to promote and teach TRE exercises, certify practitioners, and facilitate certification workshops for individuals as well as private organizations all over the US. A DVD demonstrating modifications and adaptions to the TRE exercises which Jacy co-created is currently for sale on the traumaprevention.com website and is required in the Certification Program. So excited to have Dr. Sarah Moore assist in teaching Module 1. She comes with an extensive medical and psychological background in Integrative Therapies. Dr. Sarah Moore is an Integrative Psychiatrist and therapist. She comes with eleven years’ experience with people diagnosed with cancer. She is a Certified TRE Provider, and enjoys teaching retreats that combine TRE, meditation, and self-care. She is currently in private practice in Madison, WI. and does consulting for organizations in the area.